I briefly considered capitalizing all the letters of the word “More” in the name of this blog to emphasize the word a bit, uh, more. I think “So Much MORE!” looks great. But I decided against it because I was afraid people would think MORE was an acronym for some sort of alternative lifestyle or belief system I couldn’t fully explain. Living deliberately, thoughtfully and with attention to every action makes life better. When I get busy, I seem to miss some of the details of life, but living more mindfully means living with greater focus. Whether you’re trying to decide if you should use a disposable plate when you have plenty of washable ones or you’re making a decision about moving out of a familiar city and into a distant one, taking actions carefully often leads to better outcomes. I don’t recommend over-analyzing a situation (as I tend to do), but I do recommend considering your choices. Even small actions have more meaning and create less stress when they’re taken deliberately. I’ll never wear a suit or tie again — because I made the decision years ago to never purchase them anymore. Some of my shirts look like curtains in a 1970s living room, but I like them. Some of my business ideas are so daft they could never work (like becoming a full-time blogger), but I’m compelled to try them and make them succeed anyway. I sometimes research subjects pretty deeply before I involve myself in them, but at some point, it’s best to put aside everyone’s advice and do things your own way. Remember that following someone else’s path only leads to success like theirs. Why not have even more success by following an original track? Something is missing from some of the blogs I read: reality. Living from a suitcase sounds like fun, but I don’t want or need to do that. I have a few nearby relatives and friends, four cats and a house I’m trying everyday to enjoy. I don’t want to move to Auckland or Amarillo, although Austin sounds nice. I don’t want to count my possessions and get down to less than 100, but I want fewer than I have now. Living with reality means grabbing the very best life has to offer without throwing out the greatness you already have. I suggest building a life around what’s already working for you rather than throwing the things you like about life out because a blogging guru recommends it. Or if you hate your life, discard every aspect of it and rebuild it. That’s facing reality, too. Whatever you do, do it with excitement. A more spiritually-load word for this is joy. Dream of a better life, then enjoy the process that takes you from here to there. Every project has its excitement, and you’re missing part of your life if you don’t bother to find it. If the things you’re doing today don’t seem to offer much excitement, maybe it’s time to make some better choices for tomorrow. 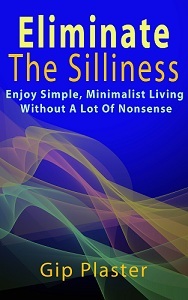 It is possible to be mindful and realistic without compromising your originality or losing any of life’s excitement. In fact, excitement comes from living within your current situation and being mindful of choices only your uniquely original brain could conjure for a better reality. In other words, so much more means so much MORE than I thought. Hi Gip, I followed your link from Becoming Minimalist. Awesome post especially the Reality part. You’re an excellent writer. Now I’m going to subscribe then read some of your older posts. Isn’t it amazing that when one hears the word MORE, they automatically think ‘physical stuff’…There is so much MORE to life than just stuff. Great post!